On the product side, Rihanna’s Fenty line changed the conversation of inclusive beauty across the industry. Meanwhile, clean beauty products entered the mainstream with beauty becoming increasingly associated with health and wellness. Despite a difficult retail environment, beauty is thriving and the number of brands in the space is exploding. 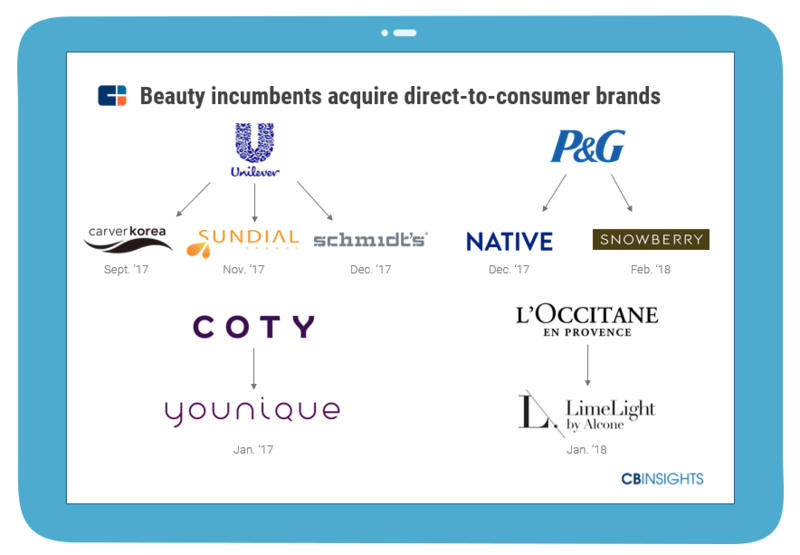 Direct-to-consumer beauty brands, which saw the largest number of deals in 2017 across the industry, are chipping away at the market share of personal care incumbents who are responding with increased M&A activity, incubator and accelerator programs, new in-store technologies, and more. What does 2018 and beyond have in store for the beauty industry? From smart home-integrated beauty devices to genomics and biotech in cosmetics and R&D, the biggest developments in tech are leaving their mark on the beauty industry. 2018 has seen leading brands embark on high-tech overhauls of product development, manufacturing, pricing & distribution, marketing & merchandising, and the customer experience. As technology becomes further integrated into our everyday lives, smart home startups are creating a range of products and services aimed at making our homes safer, more efficient, and more connected than ever before. Smart beauty devices are beginning to penetrate the home. Over the years, beauty brands large and small have introduced an assortment of high tech beauty devices. Recently, many of these devices offer consumers new ways to integrate their personal care routines into their homes using technology. 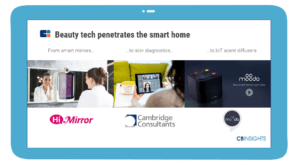 For example, the HiMirror, originally launched in 2016 by the New Kinpo Group, offers an Amazon Alexa voice-controlled smart mirror that provides beauty advice for users. The HiMirror integrates AI to offer a daily skin analysis and personalized recommendations as well as augmented reality to allow users to virtually try on makeup. 3D scanning technologies can aid in personalized skincare regimens in the home and on-the-go. Product design firm Cambridge Consultants has developed the Skintuition skin diagnostics platform while Neutrogena recently revealed the Neutrogena Skin360, a sensor-based skin scanning device with an accompanying app to measure a user’s skin over time. Beauty-focused devices can even make the home more relaxing for its inhabitants. For example, Moodo introduced a home IoT scent-diffusing machine that uses WiFi and Alexa integration to activate scent pods to keep the home smelling fresh. We could see unexpected players foray into home-based beauty devices. For example, Germany-based grocery store chain Lidl, which offers a private-label budget beauty line, recently announced a DIY face mask maker, which creates custom hydrogel face masks using collagen, fruit juice, milk, or yogurt. It’s worth noting that many of these devices lock customers to its parent brand’s products. Smart beauty devices that provide brand-agnostic product recommendations could broaden the appeal of such products for consumers in the future. Some devices, like the Lidl Silvercrest face mask maker at £34.99, are in a more affordable price range and we could see them being integrated more widely across households in the near future. However, the cost of many of these products is largely prohibitive to many consumers (the Moodo smart scent diffuser is $189). As IoT and other technologies become more widespread, we ultimately expect to see beauty devices become more affordable and connected beauty routines become more mainstream across smart homes. It’s no secret that today’s consumers increasingly seek transparency when it comes to their beauty products. By involving consumers in the ideation and product development process, beauty brands are solving for shoppers’ needs. Crowd-led feedback, whether on a dedicated platform or social media, allows for a constant feedback-loop between consumers and brands. While personal care corporates have budget for large-scale market research initiatives, most startups don’t have that kind of budget and have employed crowd-led models to gather feedback, gain immediate consumer loyalty, and develop products in a more affordable, scalable manner. Crowd-led feedback is not a new phenomenon. Multicultural personal care products company Sundial Brands (acquired by Unilever in November 2017) embraced crowdsourcing of customer feedback to develop better products before it was a mainstream phenomenon. This led to the development of a line of Jamaican black castor oil products, which ended up becoming one of Sundial’s largest lines. Many of today’s high-momentum beauty brands such as Glossier, Peach & Lily, and Wander Beauty employ emails, surveys, online communities via social media, consumer product-testing, and other strategies to solicit feedback from customers on potential products. Crowd-led models can also democratize beauty R&D. 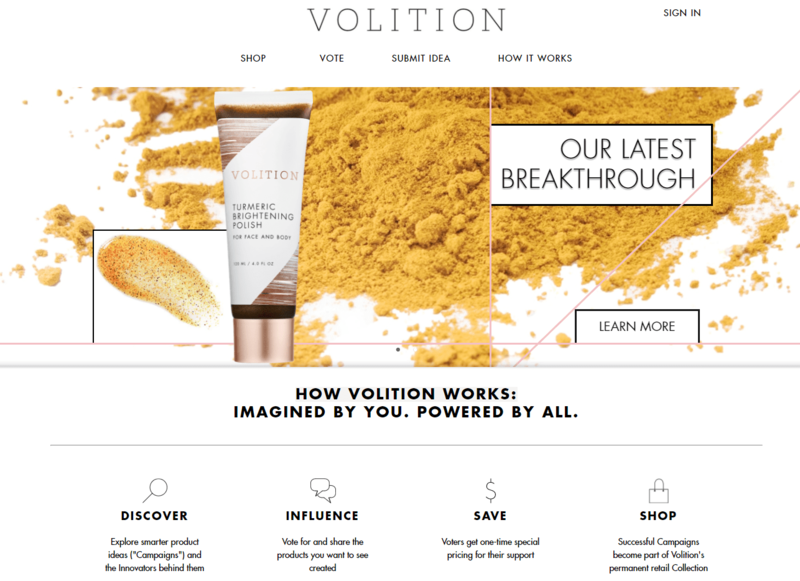 Founded in 2015, Volition Beauty is a fully crowdsourced beauty brand capitalizing on consumers who want to design their own cosmetics. The company offers a platform where anyone can submit ideas for beauty products and if an idea receives enough community votes, Volition works with top beauty labs to productionize those cosmetics. Sephora also recently bet on this crowdsourced model by beginning to distribute a few of the brand’s best-selling products in select Sephora stores in August 2017. Beauty brands can also use the crowd to outsource customer service. Limitless Technology, which uses cloud-based mobile technology and AI, rewards a company’s brand ambassadors for on-demand customer service. Unilever Ventures has invested in the company, which currently works with three Unilever’s brands including haircare line TRESemmé. Communities that provide feedback and engage in R&D are enabling crowd-led models across the beauty industry. We expect to see more beauty brands use crowd-led methods and dedicated platforms to resolve customer questions, deliver product feedback, or develop personalized beauty products at-scale. Corporates are facing more competition than ever and with up-and-coming D2C beauty brands gaining market share, incumbents are pressured to develop compelling brands that can successfully compete. Often, it can be cheaper to incubate or accelerate new companies (that could serve as potential partners or acquisitions down the line) instead of developing in-house brands. 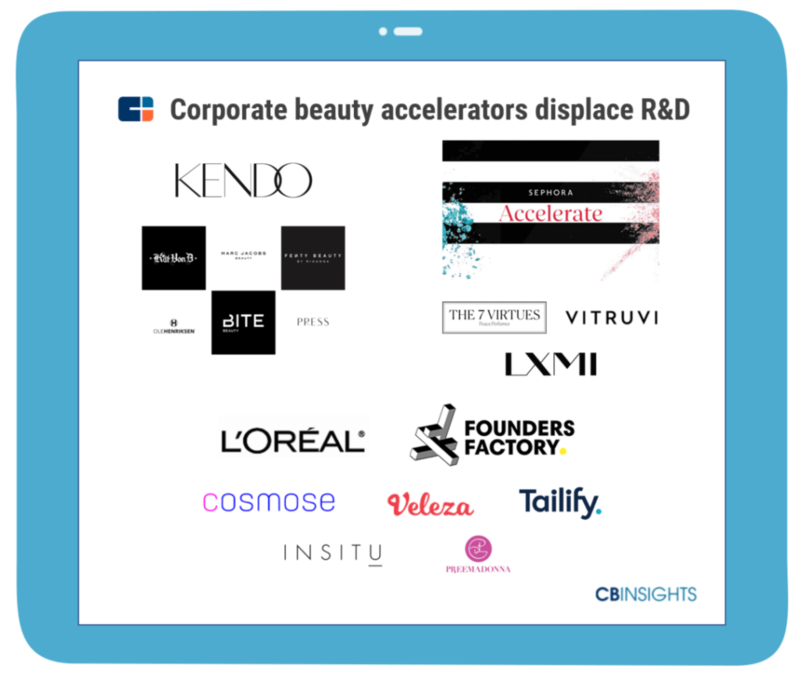 Below we highlight a few beauty accelerators and incubators established by corporates that are displacing traditional R&D in cosmetics. Kendo: Beauty brand incubator Kendo was started by former Sephora Americas CEO David Suliteanu in 2010 and is now part of LVMH’s Perfumes & Cosmetics groups. Kendo incubates brands such as Fenty Beauty, Kat Von D, Marc Jacobs, and Bite Beauty that are ultimately distributed in Sephora along with other outposts. Kendo aims turn these brands into global beauty powerhouses. For example, the launch of Fenty Beauty by Rihanna in September 2017 launched an industry shift towards inclusive beauty. Sephora Accelerate: Sephora Accelerate launched its first cohort in 2016 to help empower female beauty entrepreneurs, who are still largely underrepresented in the industry. Sephora offers nominal funding for 8 to 10 selected startups (must be invited to apply in the first place), which mostly covers travel expenses. The companies participate in a weeklong beauty bootcamp featuring workshops, events, and mentorship (which continues after the week program) culminating in a final Demo Day. Though not all brands make it onto Sephora’s shelves (to-date, only organic skincare brand LXMI, essential oils company Vitruvi, and ethical fragrance brand The 7 Virtues are distributed in Sephora), the company offers continued mentorship and networking for these brands. The company just announced its 2018 cohort. L’Oréal Founders Factory: With a strategic investment in London-based digital accelerator Founders Factory, L’Oréal selects 5 early-stage startups each year to integrate in its accelerator program. These selected startups go through the Founders Factory program but also receive additional mentorship and expertise from L’Oréal executives. L’Oréal selected 5 startups (seen below) to participate in its first cohort in January 2017. While the mainstream media has historically targeted women when it comes to beauty and grooming products, increased options for men’s personal care products are emerging. Personal care and pharmaceutical companies have been selling male-focused personal care products such as razors or hair loss prevention pills for over a century. However, many of today’s brands are employing direct-to-consumer distribution and refreshed packaging to attract a new generation of male consumers who approach masculinity differently than previouses generations. Social media, including Instagram and YouTube, has enabled more communities and conversations around men’s grooming habits. For example, beauty brand Estée Lauder-owned GLAMGLOW has taken advantage of social media to engage men by using the hashtag #menwhomask accompanied by photos of men wearing the company’s products. The brand also has launched male influencer partnerships with the first official face of the brand — actor and model Nick Bateman. “Boy beauty” and gender neutral makeup support this new market of male-focused beauty products. 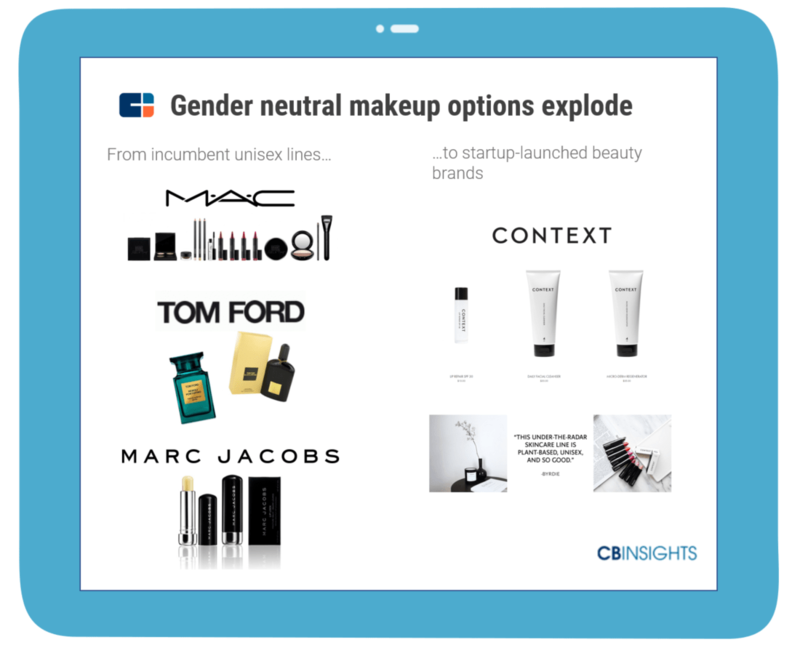 Companies like Asos, Calvin Klein, Yves Saint Laurent, Clinique, and others offer makeup for men while startups like Context and incumbent brands including MAC, Tom Ford, and Marc Jacobs have launched gender neutral makeup lines. To cater to this trend, beauty incumbents such as Maybelline and Covergirl have also announced male brand ambassadors. Brands are not just including men but also making men their core target market. 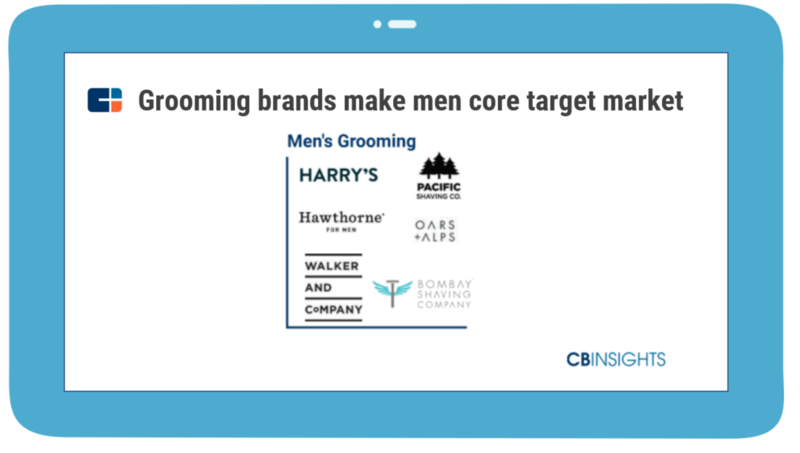 With the advent of subscription commerce for men’s personal care products, such as Dollar Shave Club and Harry’s Razor Company (which recently raised a $112M Series D tranche), we’ve seen increased focus on rebundling men’s personal care products. Since Unilever’s $1B acquisition of Dollar Shave Club in 2016 (the largest acquisition to-date in the grooming sector), we’ve seen increased M&A of men’s personal care brands. For example, Integumen acquired Scottish skincare brand Stoer & Co in 2017. Edgewell has also stepped up its activity with acquisitions of men’s grooming and skincare company Bulldog Skincare Holdings (2016) and most recently, men’s luxury skincare brand Jack Black (2018). Beyond shaving, startups are reimagining the conversation around hair loss for men. Hims produces a suite of haircare products and supplements designed to prevent hair loss for men. The company just received a $40M Series A round in March 2018 from Institutional Venture Partners and Redpoint Ventures. Personal care brands are also expanding options for men of color (leaning into the beauty industry’s push for inclusive cosmetics). Walker & Company Brands, which has raised over $33M in equity funding, offers the Bevel shaving system, which sells direct-to-consumer razors geared towards men of color. Other brands are gaining traction including Frederick Benjamin, another shaving brand geared towards men of color, which began selling at beauty chain Ulta in February 2018. In South Asia, Delhi-based Bombay Shaving Co., which has seen over $3M in funding, is developing a shaving system for Indian men. We expect to see more D2C brands focus on men’s personal care products, especially those for men of color in aligning with the inclusive beauty trend. K-beauty hit the United States in 2011 when Sephora began carrying Korean skincare brand Dr. Jart+. Since then, Western shoppers have clamoured for Korean beauty products. E-commerce platforms such as Peach & Lily and Soko Glam along with brick-and-mortar retailers like Sephora — and now Walmart and Target — carry K-beauty products. While K-beauty shows no signs of slowing down, other countries in Asia — Japan in particular — are beginning to garner attention for their beauty products. 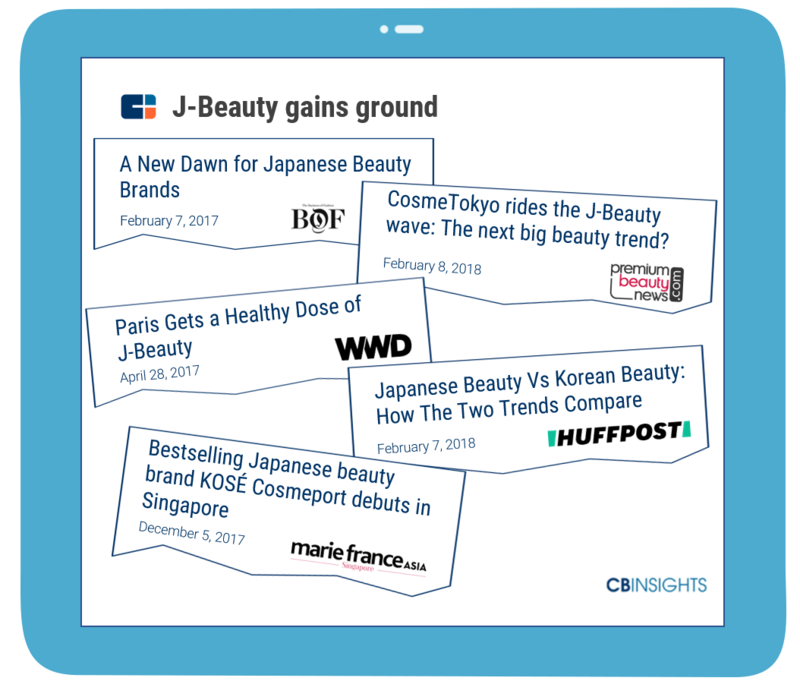 In 2018 and beyond, we will see J-beauty capture increased consumer, retail, and investor attention. What’s influencing this focus on Japan’s beauty segment? According to the International Trade Administration, Japan has the highest per capita spending on cosmetics despite very strict regulations (Japan’s Ministry of Health & Welfare only recently authorized its first product to be labelled as “anti-wrinkle”). The country has strong beauty traditions that emphasize rituals, simple regimens with multi-purpose products, and skin-supporting foods, which are seen across the Japanese diet and beauty products, which often include ingredients such as seaweed, green tea, rice, and more. Beauty, health, and wellness are embedded in Japanese culture and many consumers are attracted to Japanese beauty products due to some consumers’ perception of it as a minimalistic, luxurious approach to beauty. 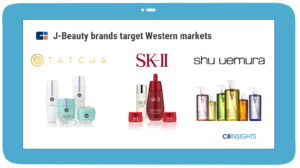 Western consumers area already consuming J-beauty products. For example, luxury beauty brand Tatcha, which distributes in Sephora, offers a skincare line inspired by the traditional geisha beauty rituals. 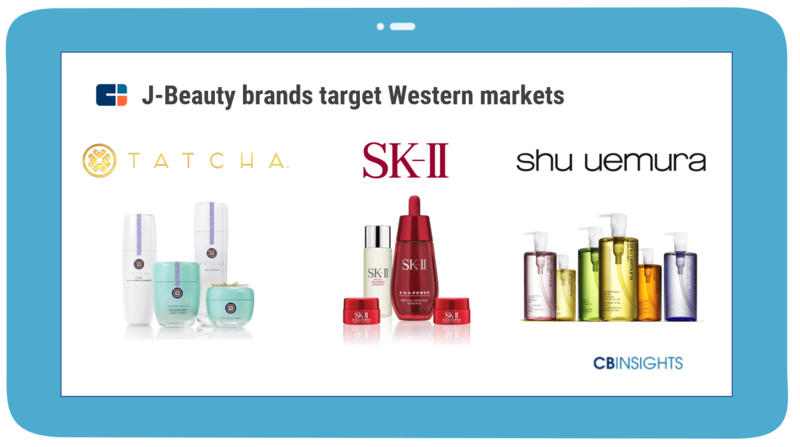 We’re also beginning to see increased buzz around J-beauty brands such as SK-II and DHC in the United States. J-beauty brands could bring more tech to the beauty industry as well. Japan has a history of cosmetic innovation having pioneered areas such as oil cleansing (which L’Oréal-owned Shu Uemura introduced in the 1960s), stem cell-based beauty, cosmetics devices, and more. Shiseido’s investment and patent activity point to increased beauty tech capabilities in the future. 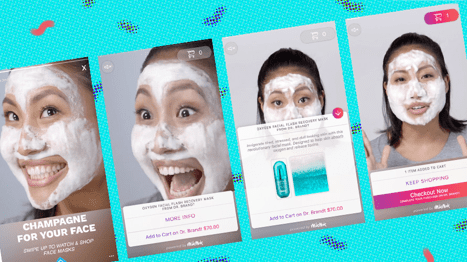 The Japanese cosmetics company acquired two AI startups last year – MatchCo and Giaran – that scan selfies and offer personalized products and tips, supporting mobile sales. Shiseido’s patents show continued efforts to design new skin cosmetics. 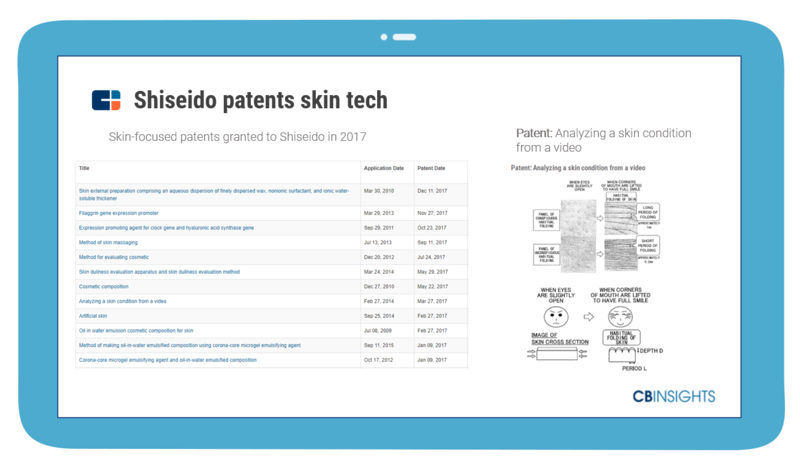 In one 2017 patent, Shiseido describes technology to analyze video images and determine the subject’s skin condition. Shiseido has even patented “artificial skin,” which could be used for testing skin pharmaceuticals and cosmetics. According to the patent, Shiseido’s method improves on previous artificial skin types by increasing communication between the dermis and the epidermal basement membrane. 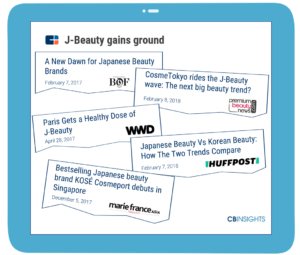 While some argue that country-based beauty could be more of a marketing play and feed into exoticizing non-Western cultures, greater media attention and increased J-beauty exports to the West indicate new opportunities for Japanese beauty brands to target new markets. Though personalization is not a new phenomenon, we’re seeing beauty brands adopt new technologies to cater to individuals’ cosmetics preferences. 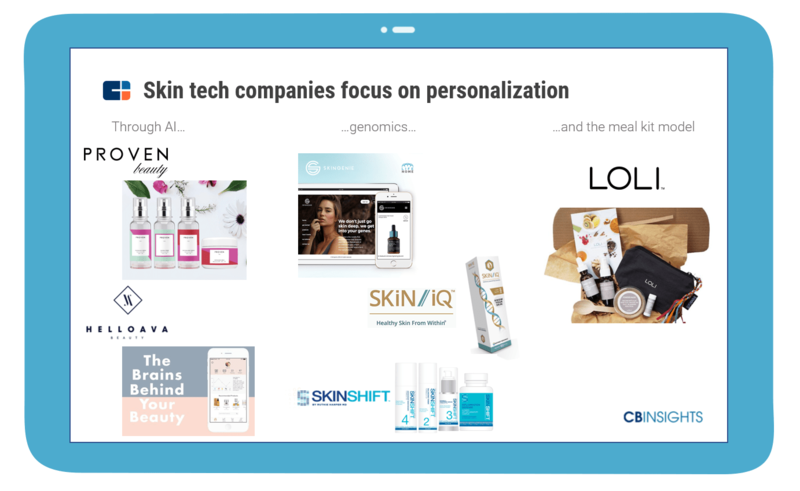 While Function of Beauty ($9.6M in total disclosed funding) and Prose ($7.6M) have gained attention for their personalized shampoos and conditioners, skin tech brands are increasingly incorporating AI and other technologies for personalized skincare recommendations. Proven ($120K) uses data from the world’s largest beauty database and machine learning algorithms to personalize skincare products while HelloAva ($300K) has launched a chatbot to guide users through a quiz to determine user-specific skincare recommendations. Beyond the use of AI, Curology ($19.1M) offers a telemedicine-based approach to dermatology by sending custom prescriptions and relying on patient photos to measure progress over time. Corporates are betting on personalized beauty as well. For example, L’Oréal’s Founders Factory invested in customized, natural skincare brand InsitU in 2017. LOLI Beauty ($610K) is pioneering a new strategy, translating the meal kit model to the beauty world to put personalization in the hands of consumers. The company originally launched as a subscription box of natural ingredients that came with instructions for customers to blend their own beauty products. LOLI now offers a blending system of bases, mix-in ingredients, and beauty recipes that bridges online retail with offline blending bars. This model could see continued momentum, as it unites the trends of personalization, subscription, and transparent ingredients. Genomics is also beginning to personalize beauty recommendations. While mainstream gene testing companies are offering skin assessments such as Pathway Genomics’ SKin IQ, companies are beginning to offer beauty-focused DNA kits. 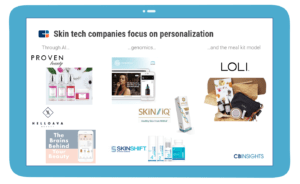 SkinGenie uses genomics and AI to provide risk predisposition scores to specific skincare traits and curated product recommendations based on a user’s genome. SKINSHIFT offers a DNA test with customized product recommendations from the company’s line of skincare products. In the future, consumers will expect customized beauty on a more frequent cadence. Romy Paris has developed a device, dubbed the Figure formulator, that blends daily personalized serums with an accompanying mobile app that coaches users based on environmental factors, sleeping habits, and more to provide daily recommendations and regular reports. Though 3D printing hasn’t played a mainstream role in beauty manufacturing just yet, we have seen early experiments such as Mink’s 3D printed customized makeup and Smashbox’s 3D printed lipsticks back in 2016. 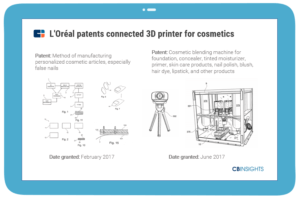 Corporate patents point to the role of additive manufacturing for beauty products in the future. 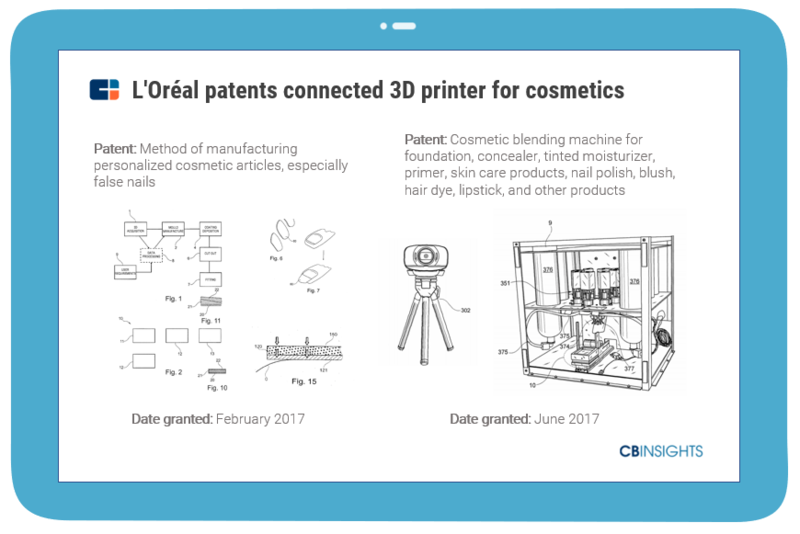 For example, L’Oréal patented a connected 3D printer, which could capture visual data from shoppers at home, identify skin tones, and print custom makeup blends. 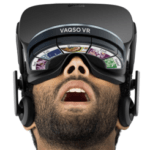 Such systems that interlay multiple technologies could help expand personalization options. While turnaround time is a concern for current customization initiatives, the beauty industry will continue experimenting to integrate these technologies for custom manufacturing of beauty products. With an increase in beauty products featuring organic and plant-based ingredients, interest in plant-based ingredients is sweeping across both food and beauty. Ingredients trending in food brands, including turmeric, moringa, coconut oil, and probiotics, are being integrated by beauty brands, and vice versa. As the line between food and beauty products thins, we expect to see beauty brands explore agriculture technology and partner more closely with farmers for ingredient sourcing. Ingredient sourcing is a major concern for beauty brands, especially ones focused on natural products. Weather, soil, wind, and other factors can make working with raw, natural ingredients difficult. Popular beauty ingredients such as jojoba oil, rosehip oil, and others have faced global crop shortages, putting brands that rely on those ingredients at risk. We are beginning to see the seeds of agtech and beauty’s convergence on a mainstream level. 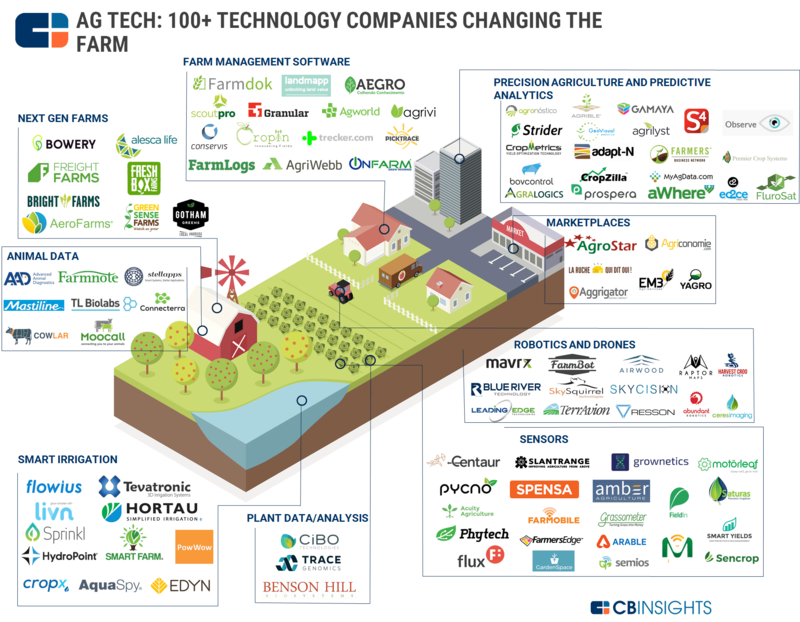 Agtech innovations such as next-gen farms (which are weather independent and could help insulate crops from potential supply chain shocks of centralized farms), farm management software, and robotics could aid in sustainable ingredient sourcing and increase speed-to-market for key ingredients in beauty products. Many natural beauty brands are already employing vertical integration by working with and basing their businesses on farms, which can function as labs to test ingredients and natural technologies. 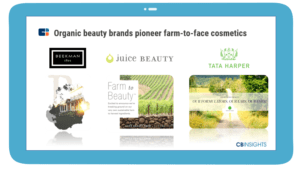 Popular natural beauty brands such as Juice Beauty, Tata Harper, Beekman 1802, and others are furthering the farm-to-face movement by renting or buying farms to better evaluate and control the ingredient production process. Biodynamic beauty, which emphasizes farm conservation, is beginning to take off, which could increase the standards for organic beauty products. Indie brands are beginning to work directly with farms and agriculture research firms to improve ingredient sustainability and develop new ingredients. For example, jojoba-infused luxury organic skincare line Ogee, which is working towards becoming a certified B Corp, offers a percentage of its sales to the Organic Farming Research Foundation to increase resources for bringing more organic crops to beauty ingredients. Another brand, New Zealand-based Te Mana Skincare, has partnered with AgResearch to develop a merino wool collagen protein that reportedly offers exfoliating and softening properties in its beauty products. We could begin to see more beauty brands converge with farming and agriculture and consumer desire for transparency of beauty products to engage with customers via agro-tourism. Lily Farm Fresh Skincare, for example, just announced that it will make its farm center and USDA-approved skincare laboratory available for public viewing to help consumers understand the beauty production process as well as interact with the farmland where its ingredients are grown. Even beauty incumbents such as L’Oréal have begun partnering more closely with with farmers. The company’s Seed Phytonutrients haircare and skincare brand, set to launch in April 2018, supports independent American organic farmers and uses sustainable packaging. We could see personal care incumbents increase their partnerships with the agriculture industry to develop organic beauty lines. Beyond agtech, biotechnologies will further impact the production of future beauty ingredients. With the increased traction we’ve seen from lab-grown meat companies such as Memphis Meats, MosaMeat, SuperMeat, and others, we expect to see bio-engineered beauty ingredients follow a similar trajectory. Companies bioengineering new food sources through cell cultures, fermentation, and genetic editing have been exploring initial cosmetics use cases. For example, unicorn Ginkgo BioWorks ($436M in total disclosed funding), which designs custom microbes for clients, has genetically engineered fermentation of yeasts to produce rose oil with new and unique scents without relying on expensive rose petals. Vegan gelatin producer Geltor also claims to serve cosmetic markets. CRISPR’s gene editing technology, while still nascent, could play a huge role in beauty ingredient production in the future. Though no concrete beauty use cases for the technology exist today, potential benefits of the technology include helping farmers grow pathogen-resistant crops or creating new species of plants. Such benefits could translate to the production of ingredients for natural cosmetics. However, future cosmetics’ use cases are on the horizon. The USDA has approved the first CRISPR-edited plants, which could usher in gene-edited foods, and ultimately beauty products. Launched in 2011 by CRISPR pioneer Jennifer Doudna, Caribou Biosciences is a key CRISPR-Cas technology startup founded for non-therapeutic research purposes across various industries. The company has noted potential new bio-based materials use cases “from fragrances and flavors to industrial cleaning and transportation.” Beyond fragrance, we could potentially see CRISPR technology use cases expand to gene-edited ingredients across makeup, skincare, and haircare products. The organic beauty movement will lend itself to more crossover between cosmetics, agriculture, and biotechnology as beauty brands seek to produce more nutrient-rich products. When Birchbox launched back in 2010, its subscription e-commerce model upended the way consumers discovered and shopped for beauty products online. Today we are seeing new models beyond beauty subscription e-commerce emerge as shoppers’ demand for cosmetics transparency is at an all-time high. 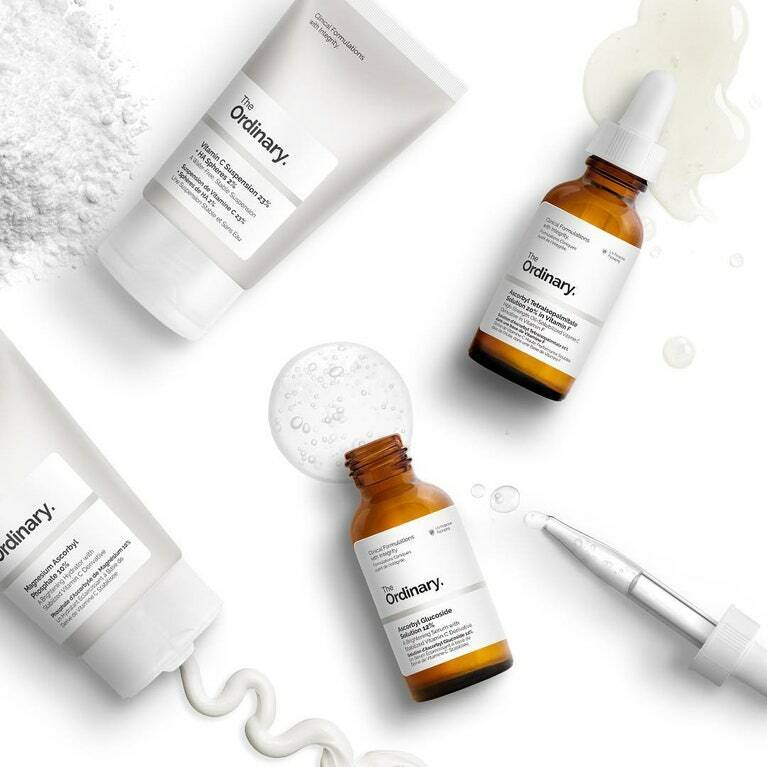 Deciem’s cult skincare brand The Ordinary emphasizes hyper-transparency, which manifests in both its ingredients and pricing. The Ordinary offers highly affordable skincare, with products often named after featured ingredients, with consumers often using a few or more products in a regimen. As the company uses established, science-backed ingredients that are cheap to manufacture, it is able to drive the price of products down to be inexpensive (e.g. $5 to $20 range). Consumer desire for transparency is inspiring new models for delivering quality cosmetics minus markups. Beauty Pie offers a monthly beauty membership that advertises itself as “luxury beauty at factory cost prices.” Customers pay $10 a month to buy unbranded beauty products at factory cost. For example, a customer would pay $5.38 for a cleanser instead of paying $32 for the retail cost. Members can purchase up to $100 total in retail value of products in a month. Beauty Pie is not the only company producing unbranded products. Public Goods ($840K in total disclosed funding) employs a similar model to Beauty Pie, with a whole line of bath and beauty products in its overall household goods assortment. 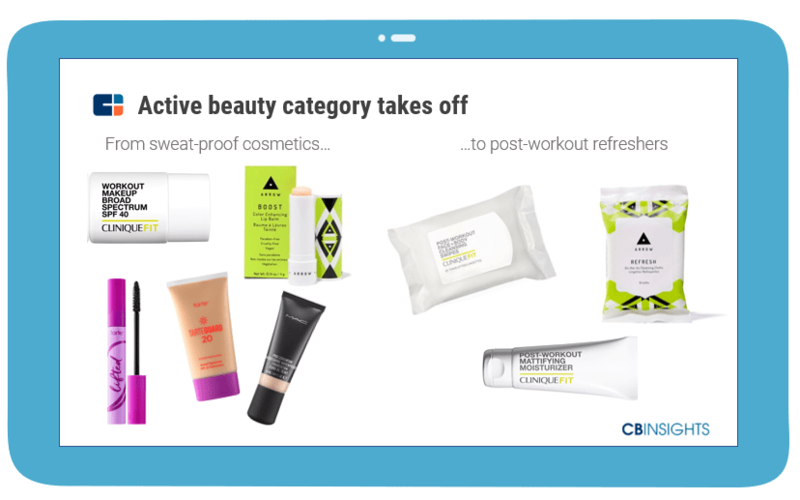 Online-only CPG brand Brandless ($52.5M), which offers a limited range of products at $3 each, recently launched basic beauty products in October 2017 including a facial cleanser, shampoo, lip balm, and more. We will see more beauty lines emphasize transparency, which will be reflected in beauty lines’ “brandless” ethos and pricing. Direct-to-consumer beauty brands have been chipping away at the market share of beauty corporates. Personal care corporates are biting back by acquiring high momentum brands or incorporating D2C into their own business models. The end of 2017 saw significant M&A activity in beauty with personal care giants focusing on inclusive and natural beauty products. Unilever has particularly focused on ethnic markets indicated by its acquisitions of K-beauty brand Carver Korea in September 2017 and aforementioned Sundial Brands in November 2017. Both Unilever and P&G acquired natural deodorant brands (Schmidt’s Naturals and Native, respectively) in December 2017. P&G, which sold the majority of its specialty beauty business to Coty in 2016, most recently bought New Zealand-based prestige skincare brand Snowberry. 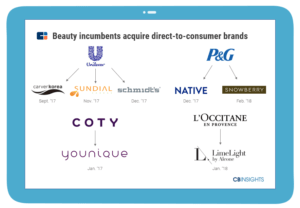 Other incumbents like Coty (which took a corporate majority in Younique in January 2017) and L’Occitane (which took a corporate majority in natural beauty line Limelight by Alcone in January 2018) have also ramped up their activity. Beyond acquisitions, incumbents are launching other D2C initiatives. For example, Unilever has launched a number of new brands in the last year to compete with direct-to-consumer personal care startups. These brands range across the spectrum of distribution channels including fully direct-to-consumer personalized skincare subscription Sensei (currently in beta); ApotheCARE Essentials, which offers limited e-commerce and in-store distribution; and Love Beauty and Planet, launched at a much wider scale with grocery, drug store, and specialty beauty distribution. These new brands target consumers seeking natural beauty products and emphasize sustainability. Acquisitions will continue to proliferate and beyond personal care corporates, we could see major players from other industries snap up beauty startups. Beauty incumbents will also continue pursuing D2C initiatives as they attempt to address gaps in their portfolios and better compete with independent cosmetics brands. While companies like Mary Kay and Avon pioneered the peer-to-peer selling model, they’ve since struggled to capture modern-day shoppers. However, social sales models are seeing a resurgence. For example, Glossier’s online-only representative program, which reportedly has around 500 reps, features landing pages for each rep to promote and sell Glossier products. Similarly, BeautyCounter, which doesn’t spend budget on traditional advertising, relies on its network of independent consultants to sell products. Billion dollar beauty brands are employing social sales as a core part of their merchandising strategy. Younique (acquired by Coty in January 2017) uses a digital selling model which includes personal e-commerce sites for sellers, online selling “parties,” and more while Rodan + Fields employs before-and-after selfies and social media to attract sales. Beauty retailers are also capitalizing on social media platforms to drive sales. Sephora has experimented with Instagram shopping where users can view Instagram Stories, which turn into shoppable posts and within a few clicks, are redirected to the original site where they can make a purchase. Smaller beauty brands are also taking advantage of their strong social media communities by selling their products via Instagram shopping. Influencer marketing also plays a large role in the beauty industry. 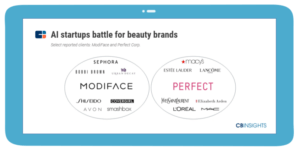 Startups like Reelio, Mavrck, and Popular Pays that connect brands with influencers have worked with companies such as Clinique, Ulta Beauty, Unilever, and others. Big beauty brands are even developing programs designed to attract up-and-coming beauty influencers. Conde Nast-owned beauty magazine Allure partnered with Coty-owned Covergirl to launch “Allure Incubator.” While not a traditional incubator focused on developing startups, the program pits aspiring influencers against each other until one is chosen to join Covergirl’s influencer network Covergirl Collective. We expect to see more beauty brands adopt these models as well as new viral merchandising strategies in the future. Beauty products and experiences are increasingly being associated with health, fitness, and wellness. For boutique fitness studios, post-workout beauty products are becoming just as important as the workouts themselves. Many studios have partnered with luxe beauty lines to offer attractive amenities, which can attract increased customer attendance. Barry’s Bootcamp, for example, offers products from luxury haircare line Oribe in its locker rooms. Evidence of fitness and beauty’s convergence is evident in the active beauty category, which originally offered sweat-proof makeup designed to be worn while exercising and now has expanded to beauty products that emphasize post-workout benefits of cleaning up and calming down. This rise of “athleisure beauty” has spurred a new crop of beauty brands such as Sweat Cosmetics, Birchbox’s Arrow line, Rae Cosmetics, and others. Incumbents such as MAC, Tarte, and Clinique have evolved to offer dry shampoos, sweat-proof mascaras and tinted moisturizers, and more. As beauty brands cater to consumers’ exercise regimens, fitness brands are also beginning to foray into beauty. 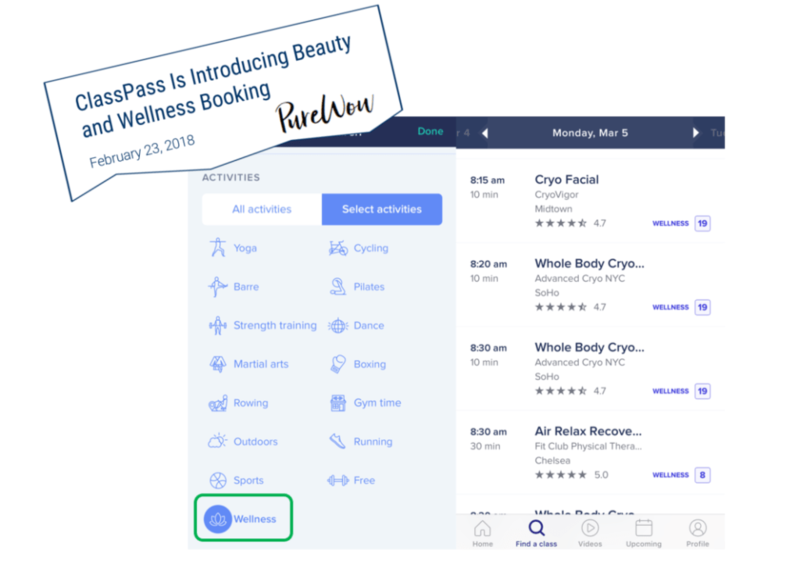 For example, ClassPass has recently been experimenting with on-demand beauty and wellness offerings including infrared saunas, cryotherapy, and beauty services including massages and facials. Partnerships have seen traction with high-momentum beauty and fitness brands promoting each other’s products and experiences. 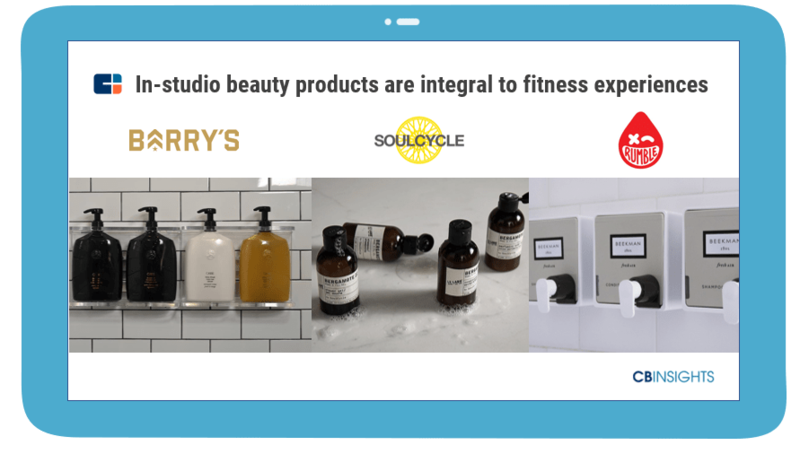 For example, cult beauty brand Glossier and luxury fitness chain Equinox are partnering to offer Equinox members Glossier product discounts within Equinox’s app as well as sell Glossier products after hosting Equinox workout classes for members. Beauty and wellness are also converging. As beauty becomes increasingly associated with gut health, what we put in our bodies becomes just as important as what we put on our bodies. Celebrity-launched beauty lines such as Gwenyth Paltrow’s Goop and Miranda Kerr’s Kora Organics emphasize the wellness benefits of their beauty products. While beauty supplements aren’t a new concept, there is a renewed emphasis as startups are offering suites of vitamins and supplements that promise beauty benefits such as weight loss, clearer skin, and stronger hair. Beauty retailers such as Sephora and Ulta distribute beauty-focused vitamins and supplements. Sephora, for example, sells products from Hum Nutrition ($7.5M), which offers personalized, nutritionist-designed vitamins, as well as from Moon Juice, which offers adaptogenic beauty powders focused on hair and skin. Investors have recently backed other new vitamin startups that focus on hair and skin, including Vital Proteins, as well as luxury-focused vitamins and supplement startups such as The Nue Co. and WelleCo (which raised a private equity financing round in February 2018). We expect to see increased crossover between beauty, health, wellness, and fitness with major players from these industries beginning to play in these adjacent sectors. With the overwhelming number of cosmetics brands today, the in-store experience for beauty retailers is crucial in helping consumers discover new cosmetics and ultimately drive sales. Sephora, in particular, has pioneered a variety of in-store technologies for beauty retail to draw foot traffic including digital, interactive screens that suggest products and teach customers new makeup tricks, Color IQ facial scanning to help customers find the perfect skin tone match, and even a touchscreen to let visitors smell scents for fragrance. In-store technologies can help increase customer engagement with brands as well as boost in-store and mobile sales. Beauty retailers are partnering with startups to drive such in-store interactions. Companies like Perch, Vengo Labs, and Ksubaka offer interactive digital displays to attract shoppers while NewStore powers apps for brands that offer in-store capabilities for personalization and omnichannel shopper tracking, among other features. Shopper tracking technologies can also increase mobile sales and conversion rates. Smashbox partnered with ModiFace for eye tracking insights of customers to heat map where areas on a screen are receiving more attention by users. 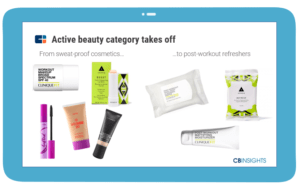 This helps Smashbox understand which features users are the most interested in and iterate on its website to make the beauty shopping experience more seamless for consumers. Augmented reality became mainstream in the beauty industry in 2017. Perfect Corp and ModiFace, which both offer virtual try-on technology for beauty brands, established themselves as the go-to providers of augmented reality for the beauty industry and work with top cosmetics brands including Sephora, Estée Lauder, and L’Oréal. Both companies combine augmented reality and AI to let shoppers virtually try on different looks, while simultaneously collecting behavioral data for brands. In 2018, we are seeing beauty applications for augmented reality expand beyond trying on makeup. L’Oréal recently worked with ModiFace to add an augmented reality feature to its “Style My Hair” app that helps consumers visualize what their hair will look like after a coloring treatment. 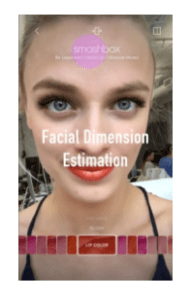 Benefit Cosmetics (owned by LVMH) partnered with ModiFace to launch an augmented reality tool to help users try on different brow types before getting waxed or plucked. Though most attention has gone towards augmented reality applications, virtual reality could also play a bigger role in the beauty industry moving forward. NYX Professional Makeup recently partnered with Samsung to launch an in-store VR experience to virtually connect consumers with beauty gurus. 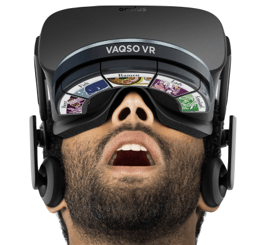 Japan-based Vaqso ($600K in total disclosed funding) produces clips for VR headsets that emit scents related to the VR content, thereby enabling multisensory VR experiences. We could see the technology’s application extend to fragrances. Beyond in-store experiences and revenue drivers, these technologies could be further employed for beauty education and training. Estée Lauder partnered with Perfect Corp to launch the “Estée Lauder Augmented Reality Training” program to train its global sales associates. The company uses technology to host live monthly training sessions for its sales staff to cover new products or makeup application tips. 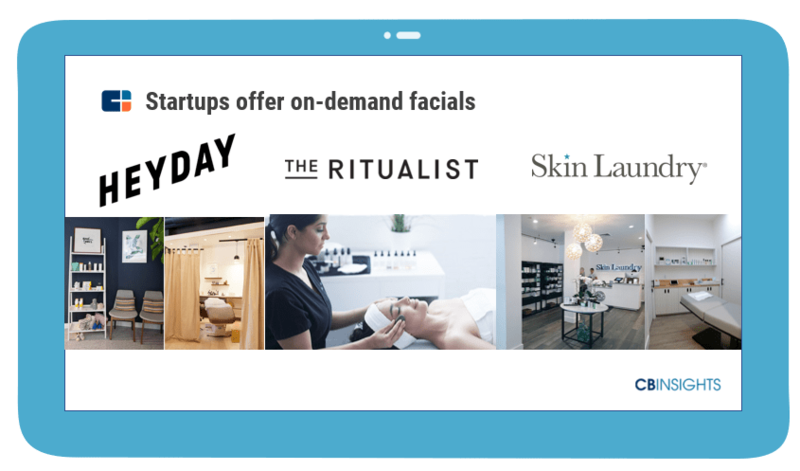 Beauty services are decoupling from the traditional institutions of spas and salons thanks to on-demand technologies. Founded in 2008 and with over 90 locations today, Drybar ($97.7M) was an early salon upender by offering salons solely devoted to hair blowouts. Beyond hair care, companies like Heyday, The Ritualist, and SkinLaundry offer on-demand facials while startups such as Glamsquad send stylists directly to people’s homes or offices for makeovers, hair styling, or manicures. Personal care incumbents and and retailers are betting on beauty experiences as well. Unilever Ventures and UK-based retailer Debenhams invested in on-demand beauty platform Blow. Debenham’s investment in particular, which supports our trend of retail, fitness, and beauty merging together, aligns with the struggling retailer’s new strategy and will bring Blow “bars” into its stores. Following our trend of beauty devices integrating with the smart home, we are beginning to see many of these beauty services being unbundled, from spas to salons, and experienced in consumers’ homes. Corporate patents point to this trend. 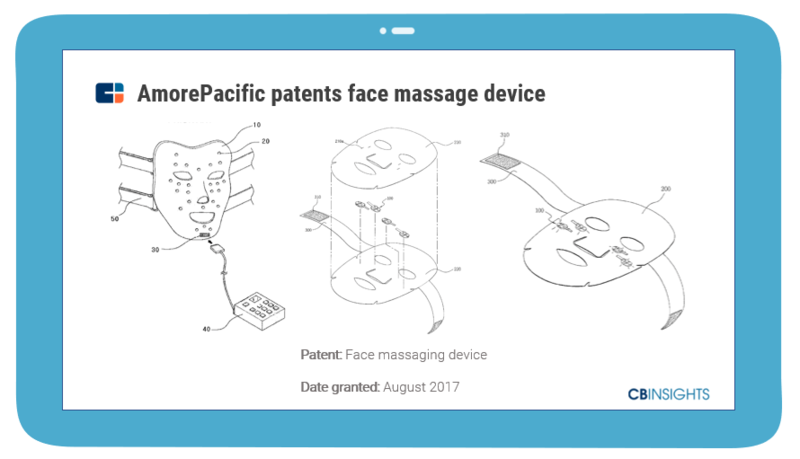 AmorePacific filed a patent for a “face massaging device” that can “provide various massage functions…similar to massage carried out by human hands” to prevent aging and improve skin elasticity. Such devices could potentially point to a future of at-home spa and salon services. Unbundled beauty services will proliferate and allow consumers to access beauty services outside of traditional environments and in the comfort of their own homes. Beyond these major industry trends, the beauty industry is beginning to see greater regulatory scrutiny amidst increased “greenwashing” across the sector (where brands claim their products are organic or natural when such may not be the case), and a greater consumer desire for transparency when it comes to beauty products. Introduced in May 2017, the Personal Care Products Safety Act would give the FDA more power to regulate ingredients and ban toxins in cosmetics and personal care products. On the state level, California recently introduced a bill dubbed the California Cruelty-Free Cosmetics Act that would forbid importing any animal-tested cosmetics brands into the state after 2020. We expect these regulations to force both personal care incumbents and smaller beauty brands to rethink their approach to cosmetics formulation, especially when it comes to natural-labeled products. Similar to how consumers are seeking greater health benefits, transparency, and sustainability from their food, beauty shoppers are looking for the same benefits in their cosmetics. And so, beauty brands are increasingly becoming tech-enabled. Technologies including AI, 3D printing, and perhaps even blockchain, are and will continue to make the beauty product lifecycle more efficient and personalized for consumers. Between these short-term pressures and long-term changes, the beauty industry will be an exciting space to watch in 2018 and beyond.